After seven years of the Tories endlessly using their ludicrous "not enough money" rhetoric as justification for continual cuts in infrastructure investment, education spending, emergency services, public sector wages, in-work social security, child welfare, disability welfare, the NHS, local government budgets and more ... they've suddenly found £1 billion out of nowhere to bribe the DUP into helping Theresa May maintain her tenuous grip on political power. Of course the £1 billion isn't going to cost the Tories anything directly because they're brazenly using public funds for their own personal benefit, but as is so often the case with the Tories, they've only considered the deal in cash terms, with no consideration of the wider socio-political implications of what they've done. "If she can find £1 billion to save her own job, why can't she find £1 billion for ..." is an argument that is going to come back and haunt Theresa May and the Tories every single time they try to continue their ruinous austerity agenda. Every time they vote to slash wages, in-work social security for the working poor, cut infrastructure spending or defund public services people will rightly ask why these cuts are necessary when there's plenty of cash to be found to save Theresa May's bacon by buying votes from the DUP. This buying votes from the DUP theme is going to hammer the Tory austerity narrative to pieces which will leave them with the impossible choice of carrying on regardless and taking the repeated hits to their reputation or abandoning austerity and implicitly admitting that their critics were right all along and seven years of ruinous Tory dogma was imposed purely by choice. Another cost that Theresa May seems to have neglected is the fact that her fellow Tories are going to have to wear a reeking orange order millstone around their necks as long as this outrageous vote-buying deal lasts, and likely a hell of a lot longer. 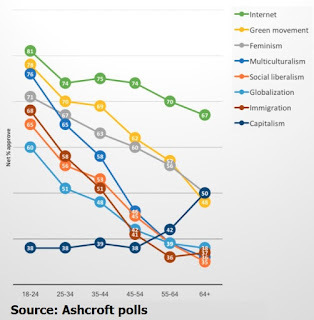 The Tories are standing on a demographic trapdoor because the younger generations are repulsed by their hard-right ultra-nationalist posturing, their depraved smearmongering tactics, their divisive anti-immigrant posturing, and their determination to make the lives of the majority of us worse in order to fund ever more handouts for corporations and the mega-rich. 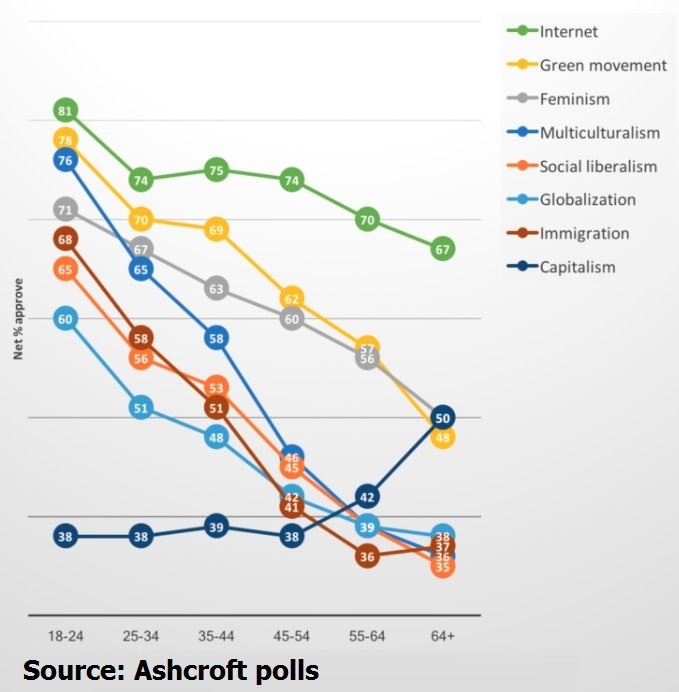 The younger generations are very much more likely to see feminism, environmentalism, and liberal social values as positive things, so hanging the orange order millstone of gay-hating, women's rights-opposing, climate change-denying DUP extremism around their own necks is only going to hasten their fall through the already creaking demographic trapdoor. Now that the DUP have established that the Tories are willing to lob vast amounts of cash at them (£100 million per Westminster vote) does anyone seriously believe that they won't be coming back demanding more and more? The DUP are not a bunch of spineless strategically-inept power-hungry wimps like the Lib-Dems. 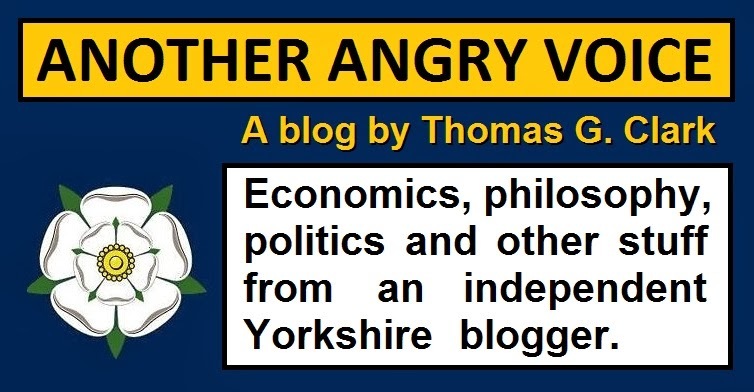 They've not bound themselves into any kind of five year deal or agreed to completely shaft their own core demographics (the anti-Tory Lib-Dem vote, students, anti-imperialists, political modernisers ...) for a tiny taste of second hand Tory power. Does anyone seriously believe that the DUP will gladly settle for what they've already blagged, and won't seek to hold the Tory government to ransom whenever they see that they hold the balance of power? Perhaps the biggest price of all from Theresa May's outrageous vote-buying deal with the DUP is the way it is jeopardising the Northern Ireland peace process. Theresa May and the Tories can't say that they weren't warned. Even the former Tory Prime Minister John Major spoke of the dangers of siding with the DUP, especially at a time when Northern Irish politics is as unstable and secularised as at any time since the Good Friday Agreement was signed in 1998. The Northern Ireland Assembly was already paralysed by deadlock, then there was the eradication of all of the middle-ground parties in Theresa May's vanity election (10 DUP, 7 Sinn Féin, 1 Independent) meaning Northern Ireland is in a tinderbox situation. The UK government demonstrably favouring one side over the other can only possibly make the situation worse. The fact that Theresa May has decided to lob peace in Northern Ireland onto her bonfire of vanity in order to salvage her own political career is absolutely despicable. 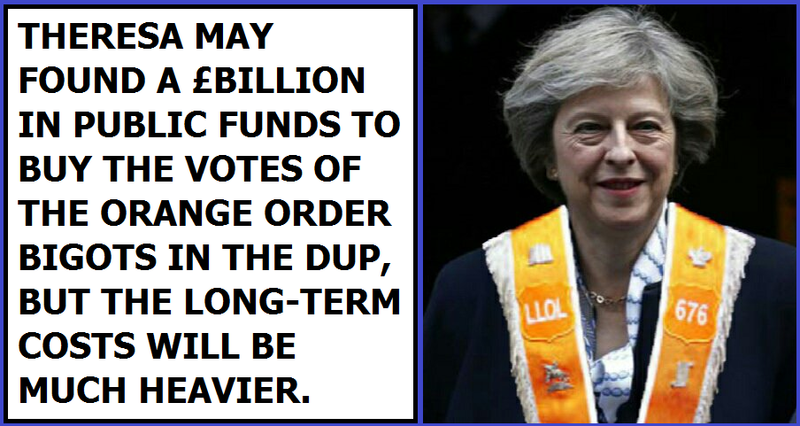 If her dodgy vote-buying deal comes at the cost of rising sectarian violence, then the Tories must be held accountable for putting Theresa May's self-interest above maintaining peace, and selfishly wrecking one of the greatest cross-party achievements Westminster politics ever managed. Theresa May and the Tories decided to use public cash to buy the votes of the DUP bigots under the delusion that the it would be the taxpayer who bears the cost, not the Tory party. In cash terms they're correct. They have used public cash for their own narrow party-political benefit, but the Tories are notorious for knowing the cost of everything and the value of nothing, which means they've ignored (or at best seriously underestimated) the wider socio-political costs of what they've done, not just to themselves, but potentially to the people of the United Kingdom and Ireland who will suffer enormously if this move ends up collapsing the delicately balanced peace process in Northern Ireland.